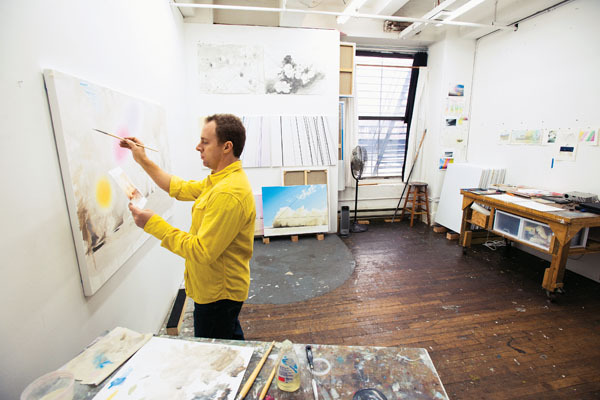 Standing against a wall of his 350-square-foot Brooklyn studio, artist Eric LoPresti ’93 feels the pressure of an approaching deadline. “February may seem like a long way away,” he says, with a nervous laugh. It’s mid-November, and in early February, his solo exhibition, No Blue Skies, will open at the Kunsthalle Galapagos Gallery in the emerging arts neighborhood of Dumbo. This won’t be LoPresti’s first solo exhibition—it will be his ninth since graduating from the Maryland Institute College of Art in 2002—but in some ways, it will be a departure. The showcase painting will extend 15 feet across the gallery’s 25-foot wall. At this point, the piece exists only as a sketchy mock-up on three four-by-three-foot canvas panels. He’s never worked this large before. Home for LoPresti was the vast, desert-like terrain of eastern Washington state. The economic base of his hometown of Richland was the Hanford Site, a plutonium production facility established in 1945 as part of the Manhattan Project. “It was a secret city back in the day, on par with Los Alamos,” says LoPresti of the Hanford Site. The plutonium for “Fat Man,” the atomic bomb that exploded on Nagasaki in August 1945, killing more than 80,000 people, was manufactured there. Although the site had long ceased to be secret by the time the LoPrestis moved to Richland in 1980, “people didn’t talk a lot about Hanford’s main mission,” he says. LoPresti also imbibed the power of the natural landscape. “My aesthetics were really formed when I was living in the desert,” he says, referring to the treeless stretches of dry land on the Columbia River Plateau, where Richland lies. He says the land can seem desolate—“blank,” even—to people unfamiliar with the region. But LoPresti sees color everywhere. Not bright color, but dramatic, striking color nonetheless. “The color’s very subtle, and you have to kind of be tuned in to the misty sort of pinks, browns, and yellows,” he says. In one series of paintings, he depicts aerial views of the Hanford site, at different points throughout its history, with those misty desert hues superimposed. 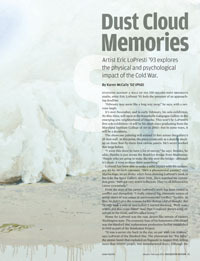 In 2010, LoPresti returned to Washington for the opening of a solo show called Afterglow. A dual-venue exhibit, it took place at both Washington State University Tri-Cities and the Richland Public Library. Joining him at the opening was Richard Rhodes, author of the Pulitzer Prize–winning The Making of the Atomic Bomb, and in 2010, The Twilight of the Bombs. In a joint lecture, the two discussed the impact of the Hanford Site on the physical and moral landscape of the region. In another series of works, which will be shown later in 2013 at the National Atomic Testing Museum in Las Vegas, an affiliate of the Smithsonian Institution, LoPresti depicts aerial views of the Nevada test site, the crater-laden expanse whose visual scars are reminders of its role as the nation’s primary nuclear test site throughout the Cold War. 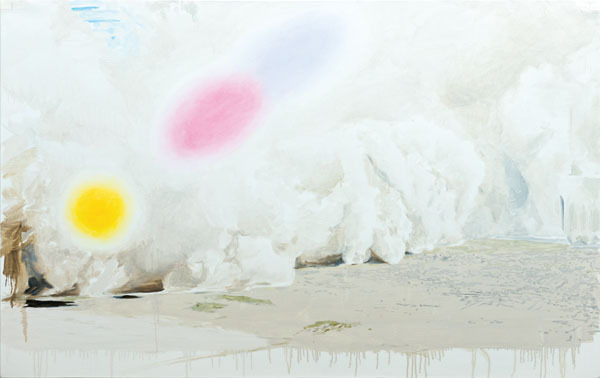 At the Kunsthalle Galapagos, the centerpiece painting will be called Dust Cloud, named for the theme that will unite the works in the exhibit. “This is the source image,” he says, approaching a small photograph tacked to the wall opposite where the mock-up now hangs. A still photograph from a video taken by a soldier in Iraq, it’s situated in a row of images, paper sketches, and notes. LoPresti explains that this particular dust cloud was produced by a helicopter landing. But that’s incidental. What he really wants to explore is the cloud itself. Coincidentally, on the previous evening, LoPresti had watched the first segment of Ken Burns’s documentary, The Dust Bowl, which aired over two evenings last fall on PBS. “It’s just apropos,” LoPresti says of the documentary. He notes that there have been several iconic dust clouds in modern memory in the United State alone. Following the disastrous dust storms of the 1930s was what LoPresti calls “the biggest of them all,” the mushroom cloud of Alamagordo. On September 11, 2001, there was the roaring, black cloud that rolled up Broadway as the Twin Towers fell. And LoPresti points to another iconic dust cloud, which he says looms largest in his own memory: the cloud produced by the explosion of the space shuttle Challenger in January 1986, which sent brilliant white streams spewing across a blue sky like fireworks. “I think if I showed you a little image of that cloud, you would recognize it immediately,” he says. LoPresti’s high school chemistry teacher, Leo Faddis, nominated him for Rochester’s Bausch & Lomb scholarship. LoPresti didn’t even know it; and then he won. He remains grateful to this day for the one-handed teacher (“he’d blown his hand off in a chemistry experiment,” LoPresti explains, with some fascination) who had acted on his behalf. “I had a really great experience at Rochester,” he says. “It really changed my life.” While majoring in brain and cognitive sciences, the student who’d always drawn and painted as a hobby ventured into the studio arts department seeking electives. He met Allen Topolski, the sculptor who’s long served as the chair of Rochester’s studio arts department and its principal undergraduate advisor. Topolski became a mentor, and LoPresti credits Topolski with helping him gain admittance to graduate school at the Maryland Institute College of Art—despite lacking the academic grounding in art, not to mention the extensive portfolio typical of most of those who are admitted to the institute’s master of fine arts program. It was a risky move. It frightened and thrilled him at the same time. And it befits the man now standing before the Dust Cloud mock-up.